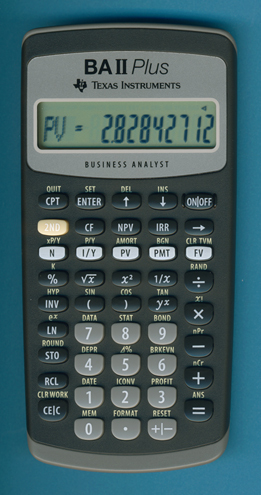 Size: 6.0" x 3.0" x 0.6"
Just a redesign of the BA II PLUS (2004) to match the appearance of the TI-30 Xa. Disassembling this BA II Plus manufactured in October 2013 by Kinpo Electronics, Inc. in China reveals no surprises. The printed circuit board (PCB) of the calculators sports a prominent BF16-10-2 logo. © Joerg Woerner, September 1, 2014. No reprints without written permission.